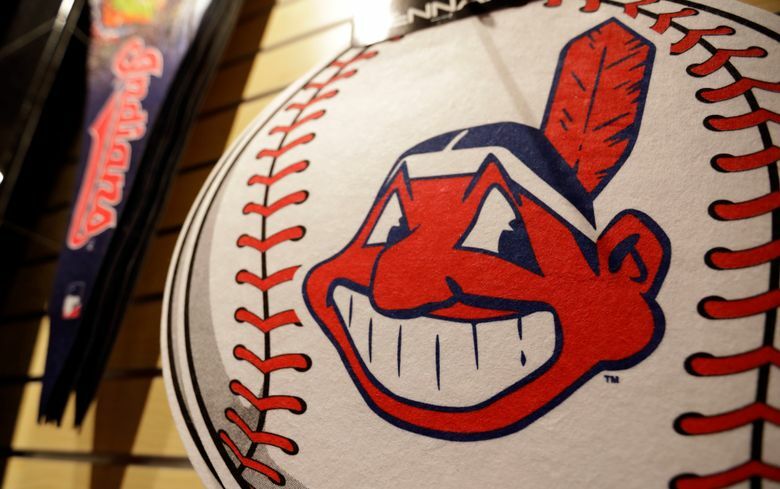 CLEVELAND (AP) — The Cleveland Indians are dropping the Chief Wahoo logo from their uniforms next year after decades of protests and complaints that the grinning, red-faced caricature used in one version or another since 1947 is racist. The move, announced Monday, came after protracted discussions between team owner Paul Dolan and baseball Commissioner Rob Manfred. The cartoonish image of a big-toothed American Indian with a scarlet face and a single feather in his headdress will come off the team’s sleeves and caps starting with the 2019 season, when Cleveland will host the All-Star Game. The decision is unlikely to quell complaints from Native American organizations and others who see the symbol — and the team’s very name — as insensitive. The Indians will continue to wear the Wahoo logo in 2018, and even after it is gone from the uniform, the club will sell merchandise featuring the mascot in the Cleveland area. Amid the intensifying debate, the club has slowly moved away from the logo in recent years. 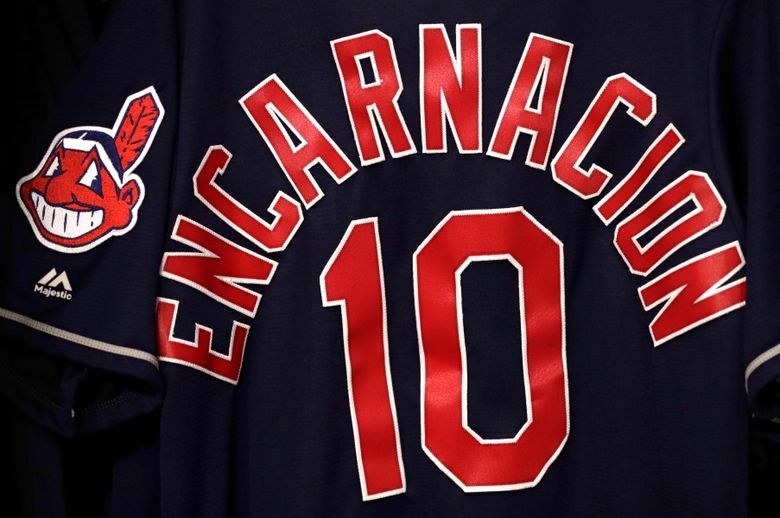 The Indians replaced it with a “C” as their primary logo and removed signs depicting Chief Wahoo from Progressive Field, the team’s ballpark. There was no immediate reaction from Indians players. 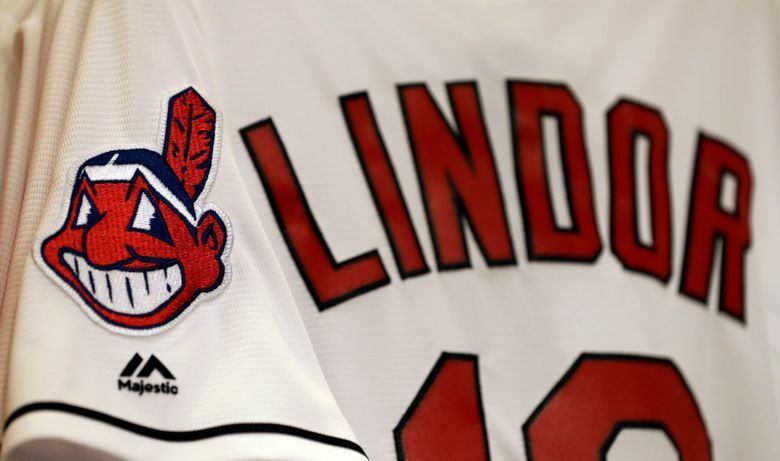 National criticism and scrutiny over Chief Wahoo grew in 2016, when the Indians made the World Series and Manfred expressed his desire to have the team drop the symbol. During the playoffs, a lawsuit was filed while the club was playing in Toronto to have the logo and team name banned from Canadian TV. A judge dismissed the case. The Indians’ bid to host the 2019 All-Star Game heightened the debate. The presence of the Wahoo logo is likely to remain strong in the stands on caps, T-shirts and signs, and other Native American references in the stadium will probably persist. For over 40 years, one fan, John Adams, has pounded a tom-tom in the left-field bleachers. 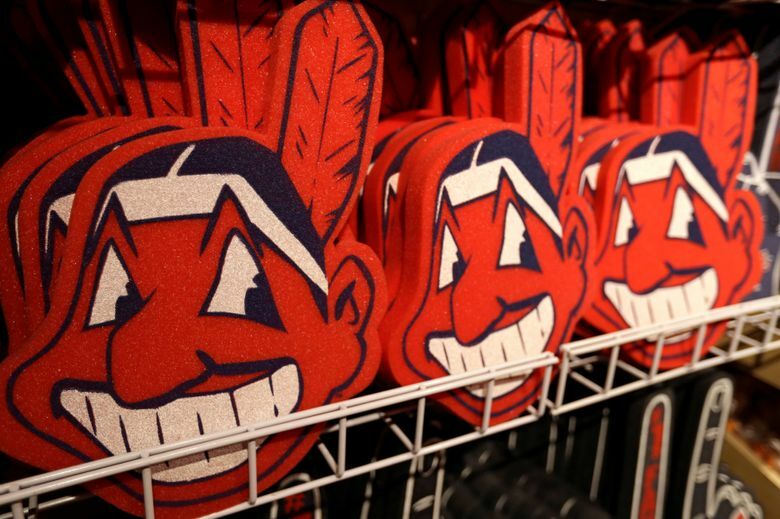 The team will continue to sell Chief Wahoo gear because if it stops doing so, it will lose ownership of the trademark, and others will be able to use the symbol as they please. Reaction to the announcement was swift on social media as fans took sides on a touchy topic that has become part of the Cleveland sports landscape for generations. 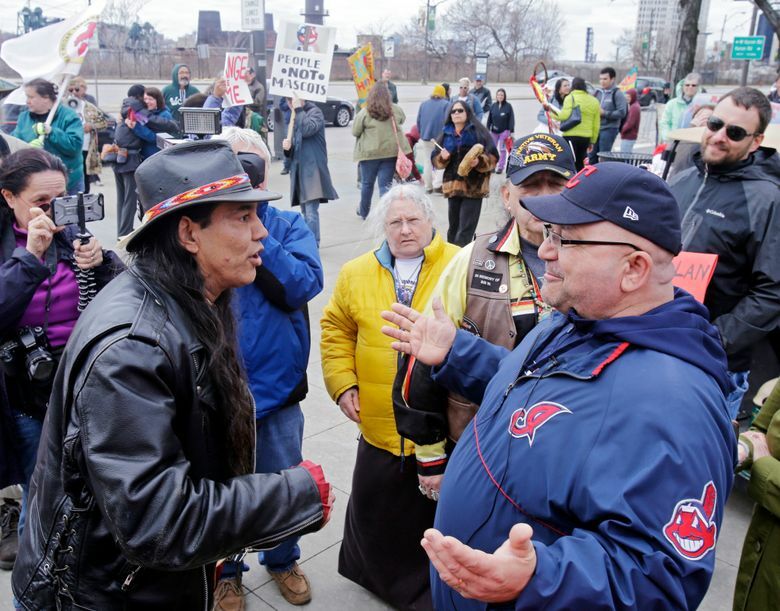 Every year, Native American groups have protested outside the stadium before the home opener in hopes of getting the Indians not only to abolish Chief Wahoo but to change the team name. 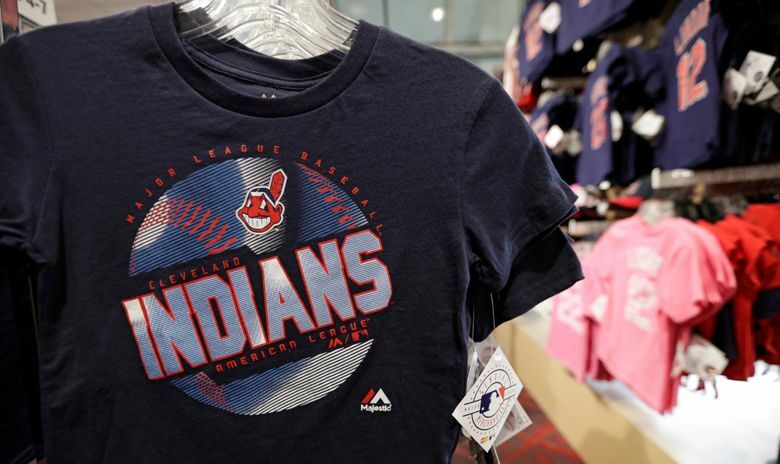 Many fans are dedicated to preserving Chief Wahoo and see the logo as a symbol of the city’s resurgence in the mid-1990s, when the Indians opened their new ballpark and the team made the World Series for the first time since 1954. The NFL’s Washington Redskins have come under similar pressure to change their less-cartoonish Indian-head logo and their name but so far have resisted. Last year, a U.S. Supreme Court ruling in another case made it clear that the Redskins name cannot be stripped of trademark protection just because some find it offensive. Stanford, Illinois and Dartmouth are among the colleges and universities that have dropped Native American nicknames or symbols for their teams over the years.